Per classified posting rules, please put up at least one clear picture, though more on a rare item like this would be better..
Or that this is a custom tank MADE FROM titanium ???? Which ever way you might want to clarify your ad so there is no buyer remorse and sale issues. From a 10k km (6000 mile) VTR that has lived indoors since new. Flawless and very shiny except for about 12 tiny chips about the size of salt grains. Could easily be touched up with a steady hand. Price is for the tank only, not the cap or plumbing underneath. Postage would from Blaine WA, would be $50 or less including insurance. Photos available. Last edited by E.Marquez; 11-24-2017 at 07:30 AM. Um, apparently 2005 models only came in Titanium color, so I thought that was self explanatory. My bad. 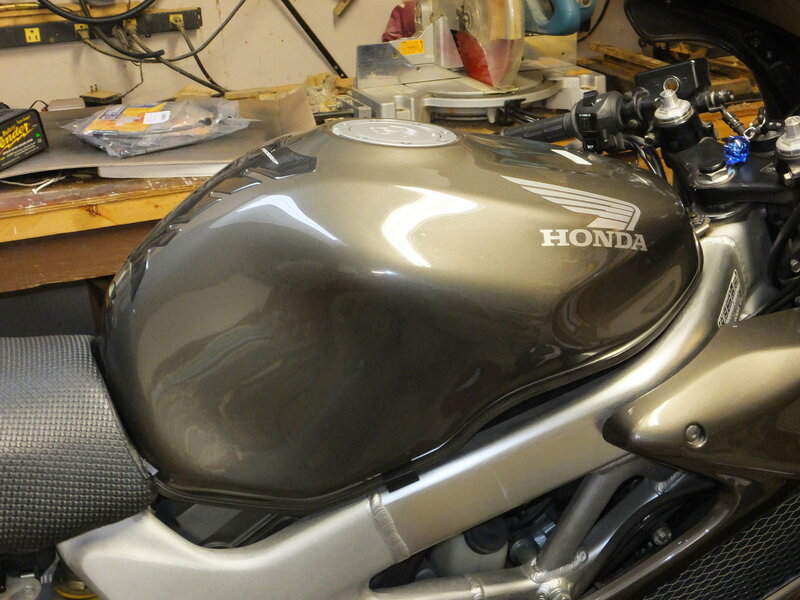 This is a stock 2005 tank, painted the factory, original titanium color. Is this the 19 liter tank? Sorry, no. I just scored one which is why this is for sale. Thanks for the pics required, look perfect. Should help you will getting what you need for it. 2005 is 12 years ago, many bikes are painted in 12 years on the streets..
Titanium was the only available color in the US, not in all markets, we see bikes from all over here. $500 is a large number for a 12 year old tank, yours may bring that premium price and I wish you well.... But I saw $500 and Titanium and immediately thought custom tank...not single color for that year in the US.. I agree it's pricey, especially with the color being specific to that one year, and there being fewer 2005 bikes than earlier years. I've not seen many (any) "flawless" tanks for sale online, and having a damaged one repaired, painted with the Honda decals reapplied would likely approach that cost. You've not seen ANY flawless tanks for sale anywhere lol because they don't exist. I have two pretty nice used ones for sale but they're not "flawless." For some reason I've always seen a variety of TL1000S tanks brand new for sale online (over $700 by the way) but haven't seen a new Superhawk tank in YEARS. I know because I bought the last one I saw and it must have been at least 10 years ago. And even if sold I it for $500 I couldn't find another at ANY price. 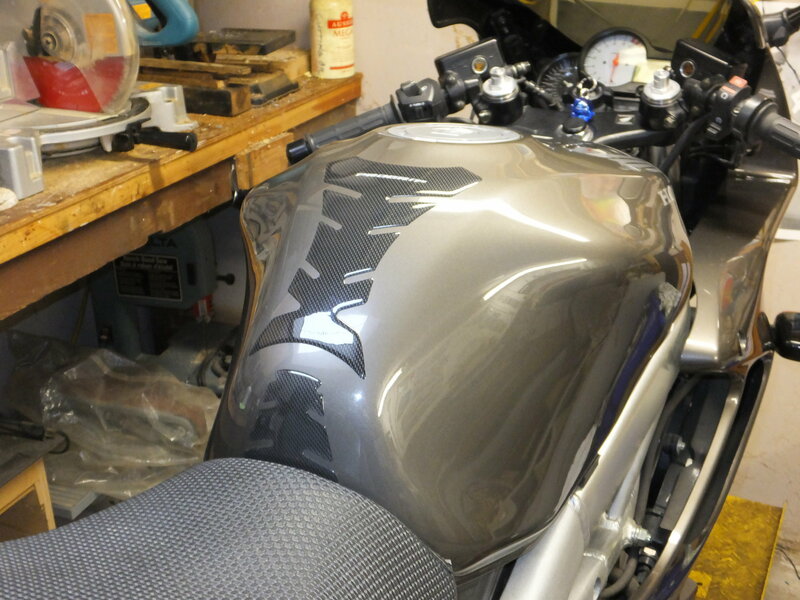 It may seem like a lot to some considering thats half as much as many of us have paid for complete bikes, but anyone familiar with any sort of tanks or replacement OEM bodywork for older sportbikes knows it becomes unobtanium at a certain point and also becomes extremely expensive. I've sold several mint red tanks over the years for around $250-$300 but that was years ago when they were still available new and nice used ones would still pop up here and there. Unlike red, being a one year only color for a pretty rare bike, you'll probably be sitting on it for awhile until someone who's picky, owns THAT color bike, and wants perfect/near perfect shows up. But I wouldn't give it away either. Especially if you've upgraded to a 19L tank, which you could easily sell later on down the road and return the bike to stock. Last edited by captainchaos; 11-25-2017 at 05:28 PM. [QUOTE=captainchaos;404725]You've not seen ANY flawless tanks for sale anywhere lol because they don't exist. I have two pretty nice used ones for sale but they're not "flawless." For some reason I've always seen a variety of TL1000S tanks brand new for sale online (over $700 by the way) but haven't seen a new Superhawk tank in YEARS. I know because I bought the last one I saw and it must have been at least 10 years ago. And even if sold I it for $500 I couldn't find another at ANY price. Reduced to $400, and see my other 2000 model yellow tank listed here.